Students of Distinction winner's Natasha Mathis and Ray Erasmo. Students of Distinction winner's Hannah Buckley and Nyjeer Wesley. 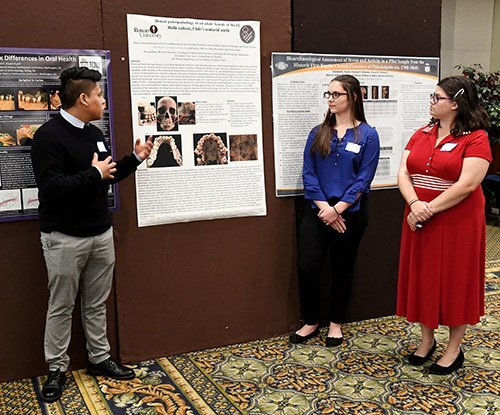 Two Rowan University students and an alumnus had the opportunity to present their research at the 8th Annual Bioarcheologists Northeast Regional Dialogue Meeting held on campus in October 2018. The BNRD is a community of bioarchaeologists who work together to create a dialog on current research in the field of bioarchaeology and related fields of forensics, dental anthropology, paleoanthropology, and primatology. The BNRD is committed to sharing information among members to help advance the field theoretically and methodologically. Led by Maria Rosado, professor of Anthropology, Rowan alumni Renzo Goicochea (Law & Justice Studies), Kristine Kortonick (Biological Sciences) and Megan Zalinka (History) presented “Dental paleopathology of an adult female of the El Molle culture, Chile’s semiarid north”. The project seeks to understand patterns of adaptation, cultural and biological, as discerned from paleopathology (study of ancient diseases) which leave indelible marks on bone. The paleopathology discoveries included dental infections, trauma, and bone infections which help to understand the evolution of disease in native peoples of this part of the world and the cultural, and environmental practices that may have contributed to them. The research focused on what dental paleopathologies reveal about the disease experience and substance practices of past human populations. It stems from research being conducted on skeletal remains of Native South Americans of the Chilean Andes in the Coquimbo region who lived between 500 and 3000 years ago. The Museo Arqueologico de La Serena (MALS) archaeologists have uncovered/discovered over 1500 individuals which are housed in the MALS. The 2018 BNRD conference was hosted by Dr. Maria Rosado and Rowan University in co-sponsorship with the College of Humanities and Social Sciences. The annual conference was started to create a smaller, regional, affordable alternative to national and international conferences for biological anthropologists. For more information on previous conferences, visit http://bnrdconf.wixsite.com/bioarchaeology/about-bnrd. 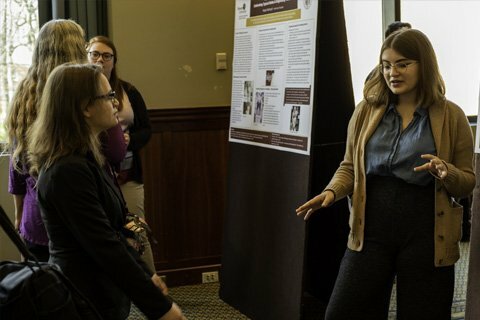 Five College of Humanities and Social Sciences students presented at the STEM Symposium on Friday, April 20, 2018. 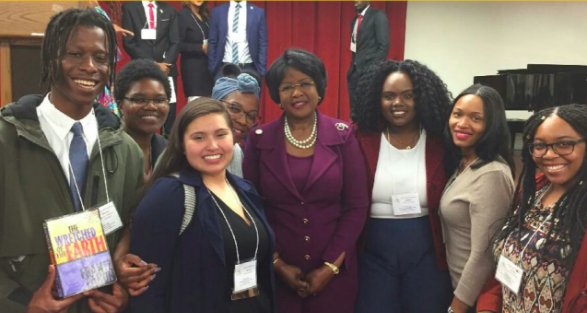 Several Africana and International Studies students shared their recent experiences at the 2018 International Model African Union Conference at Howard University, Washington, D.C. After learning about their designated country in a hybrid online Model AU course, the AS and IS majors led a Rowan delegation of students who represented Eritrea at the conference in February. 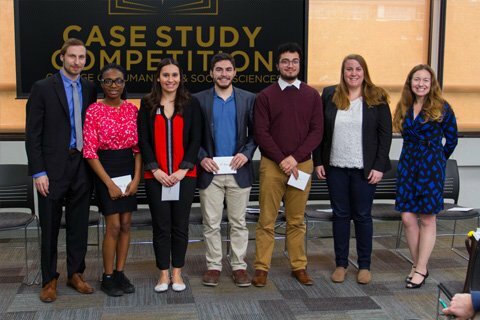 The College of Humanities and Social Sciences first ever case study competition was held this past February. Students competed testing their solutions to theoretical situations. Five teams presented then the judges left to deliberate. The team lead by Dr. Misty Knight-Finley, an assistant professor of political science, won the competition. For more information, please read the article on The Whit. Sociology alumna Miranda Reid recently published a children's novel which celebrates self love, kindness, acceptance, and friendship. The novel brings attention to bullying and shines a light for children with disabilities. Miranda is a new author born in New Jersey. 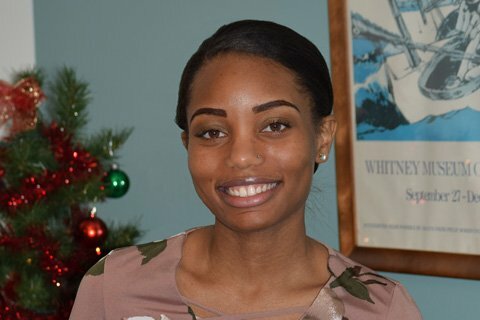 Miranda is a young woman who desires to make an impact on the lives of young children and young adults. Joshua has been awarded the first distribution of the Dr. Bela Mukhoti Scholarship in Economics. The endowed scholarship fund was formed in Fall 2015 and stipulated that the recipient must be engaged in research in Economics. Tyler Jiang, a senior International Studies and History major, recently won the 2018 Rowan University Award for Excellence in Undergraduate Research. This award recognizes research achievement by undergraduates based on the originality, impact, and quality of their research as well as the student’s skills in planning, conducting, and disseminating research. Tyler was nominated by several faculty from the College of Humanities and Social Sciences for his research on China's foreign and domestic policy, including co-written articles published by the Foreign Policy Research Institute as well as the Huffington Post, an article in Majalla, and numerous editorials in the undergraduate online Journal of International Relations published by Sigma Iota Rho, the Honor Society for International Studies. The awards committee consisted of Dr. Bonnie Angelone (Director of the Faculty Center), Dr. Harry Mazurek (Associate Dean for Research, CMSRU) and Dr. Carl Hock (Associate Dean for Research, RowanSOM). 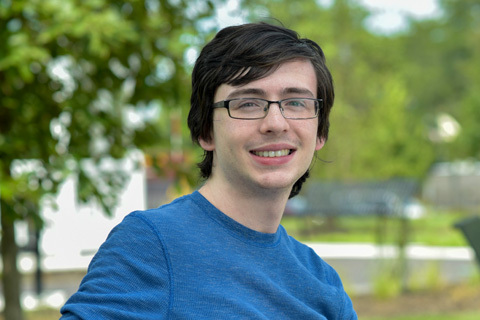 Patrick has been awarded the James M. Lynch Jr. Courage in Adversity Award. The medallion award is the highest honor a graduating senior can receive to acknowledge superior performance in a particular field. The medallion is sponsored by Dennis Lynch, son of Dr. James Lynch, who spent 22 years at Rowan where he served as the Dean of Students and later as a member of the Department of Educational Leadership.